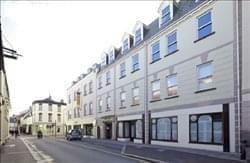 Find My Workspace lists over 95% of the serviced offices market in St. Helier. Simply click Request Quote to check pricing for one office, or Add to Basket for multiple offices. This is a centre of excellence for professional services. Thousands of leading business professionals, including accountants, lawyers, trust and investment specialists and bankers are based here. Neighbouring businesses include leading names from the financial sector. Jersey is the largest of the Channel Islands, a proudly independent state less than 14 miles from France and under an hour from London, with frequent flights to all major European business centres. Although tourism, electronic commerce and agriculture all make an important contribution, the economy is dominated by financial services. The island is a leading offshore financial centre with some of the lowest direct tax rates in Europe. This purpose-built office building with ground floor retail premises is prominently located on the busy thoroughfare of Union Street. There are currently two office suites available at 812 sq ft and 1000 sq ft. The offices have recently been refurbished to a high standard, and included the common areas of the stairs, landings and toilets. Although the offices have a traditional façade they are finished to very high specifications. To obtain information for your selected St. Helier Serviced Offices, please tick the "Add to basket" box for each office you prefer and complete the form below. We will then send a detailed report via email.